Tucson’s much loved Gem Show is over but the fun is just beginning at Bookmans! Like many in the Old Pueblo, we attended the show, braved the crowds and hoped for decent parking. It took us several trips to scout out the perfect items, those unusual and unique pieces that reflect a one of a kind character, just like our customers. 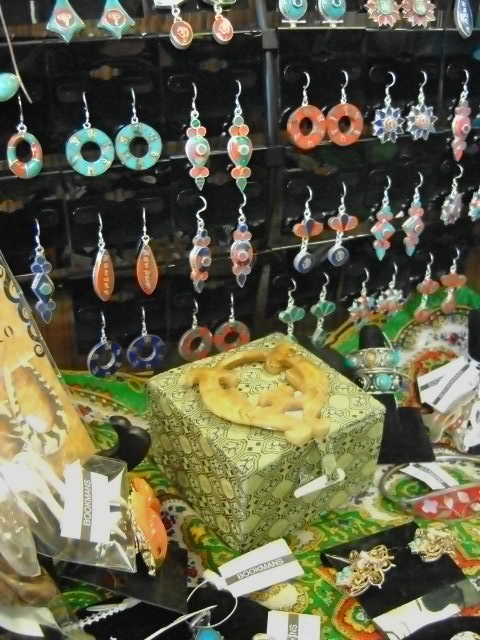 We went the gem show with you in mind and you’ll be glad we did when you see our treasures. The Bookmans universe values individuality and expression of personal style. With that in mind, we broke the bank to bring you the best deals that celebrate your personality. Check out the vibrant hues, creative craftsmanship, quirky design and boho chic throughout our collections. We have everything from pretty pearls, dazzling crystals, delicate flowers to earthy, ethnic and hand carved pieces. Do you dream of traveling through the open air markets of Indonesia? Do you adore the rich dyes and tiny bells of traditional India? Maybe you are more of a skater grrrl in love with plaid cuffs, a touch of punk spikes and studded leather. The selection is varied and we have what you least expect in a dizzying array of styles. Guys, we didn’t forget you. We know you have your own flair, so we collected cuff links, rings, gauges, belts, hemp and leather cuffs and necklaces — all with your manly vibe. From sporty to GQ, rocker to surfer, and suit and tie to shorts and tees, Bookmans has your back. We didn’t stop at jewelry because we know our peeps love all kind of cool stuff! We have prayer flags, Mexican painted sculptures, handbags, back packs and wall hangings. If you want to “rock” her world, grab a genuine semiprecious stone heart rock so she can carry your love with her. Does your guy have a geologist hidden inside him? How about some geodes, fossils or crystals? The Gem Show may be over for another year but we are going strong with treasures aplenty, and you don’t have to worry about parking!